We visited 29th Nov and parked in the main car park next door. Plenty of disabled bays right next to venue with electric doors. Unfortunately the corridor between the car park and the venue was closed – I guess because of the volume of people, so this meant we had to exit the car park go outside (in the rain, over the uneven surface etc) and back in the main entrance. Not a big problem to be honest, but as there were plenty of stewards surely we could have been let through? This was really the only drawback to the whole venue. The cafe on the ground floor is probably better value than the venue bars if you want a coffee and something to eat, and was easily accessible. Even though it was busy the staff were incredibly helpful in there. We had tickets on the balcony and were actually ‘reduced visibility’ because of glass safety barrier. This was our choice to go up here (hey, it was cheaper! ), and there is a large disabled platform on the main floor. As it was fairly quiet on the balcony the staff were very good with us and let us shift along a bit, so view was actually perfect. Toilets in venue were big enough for me to use in a wheelchair and were in fine. There’s two lifts to get up to top floor and a further lift to get on the balcony. A member of staff seems to reserve the lifts on the way out as well, which is good. As said, staff were excellent everywhere. 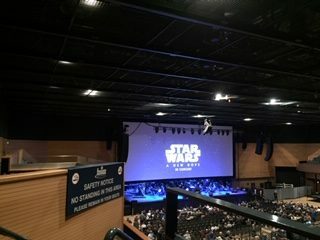 If you haven’t been to the BIC before, it is a very large venue, with several different halls depending on show or act, but be aware how busy it can get, although it seems very well run for accessibility.